This collection of stories from the author’s boyhood summers spent on his grandfather’s Tennessee farm teaches important life lessons, while also encouraging the reader to reflect on the wisdom to be found in his or her own childhood experiences. William Hardison is a retired minister and former adjunct professor of Christian Spirituality at Baptist Theological Seminary in Richmond. Known for his gift of vivid storytelling, he is a member of the National Storytelling Network. Dr. Hardison is a contributor to Character.org, a nationwide movement bringing fresh attention to the development of character in the lives of children through education. 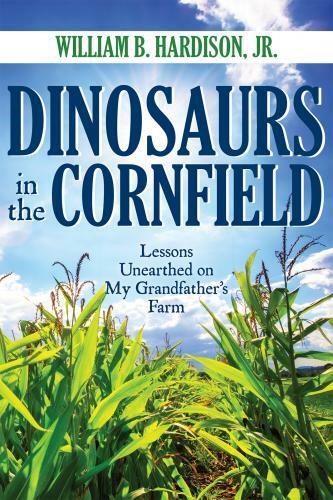 "Dinosaurs in the Cornfield" is his first book and deals with the development of positive character traits learned through the telling of legacy stories. Dr. Hardison lives in Richmond, Virginia with his wife, Carolyn. You can visit the author on his website: www.williambhardisonjr.com. Candice Smith is a self-taught artist based out of Hanover County, Virginia. A mother of three girls, she is inspired by her daughters and by nature. View more of her artwork on her Instagram: @domenico.art. --Susan Schwartz RN, MSN, MSHA, co-president of the Richmond chapter of the Virginia Writers Club, and anthologist of the three-volume set Nightmares and Echoes. Her story “Blurred Line” was nominated for a Bram Stoker Award for long fiction by the Horror Writer’s Association, January 2017 (www.susanschwartzauthor.com). --Anthony Romanello, author of "Random Thoughts: Reflections on Public Service, Fatherhood, and Middle Age"